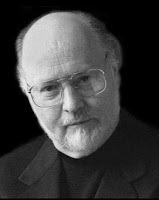 Episode 8: John Williams - Even though John Williams has composed some of the most memorable themes for some of the most successful films of all time, it does not mean that he is impervious to scoring some bad motion pictures. On this episode of of CTM, Ralph discusses three great scores to films that fell short of their mark. HERE is the only place to find Heartbeeps! Abandoned in the Woods - A.I. The Moon Rising - A.I. Hide and Seek - A.I.